Do you scour Pinterest for book list pins? I have an entire Pinterest board dedicated to book lists. I LOVE book lists. I’ve created quite a few book lists over the past few years – from books that enhance our history or science studies to lists of fun and funny books to read aloud. 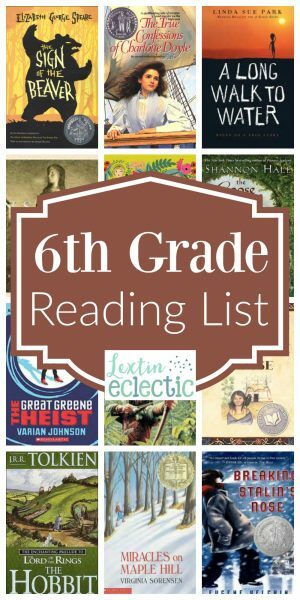 I also create a book list for each grade level so I never run short on ideas for great reads each school year. However, I found that I wasn’t being intentional when creating these book lists. Some years the books were all in the fantasy genre while other years my list was full of historical fiction. And biographies?? Oh my! We rarely read books in that genre. So I designed a plan to help me have better variety in our book lists. You can download your copy right here! I created a book list planning worksheet to help me choose a better variety of books from several different categories. I used my worksheet to help plan our reading list for 6th grade and I’m excited about all the wonderful books that are waiting to be read this upcoming school year. However, I’m still a little bit in shock that my oldest child is about to start middle school! If you need some reading inspiration, check out the list below. And don’t forget to download the book list planning worksheet so you can intentionally choose your next read alouds. Don’t miss my book list planning guide that will help you create the perfect book list for your homeschool year! Long Walk to Water is absolutely phenomenal. I suspect we will reread this one over and over for years to come. I’m so glad to here that! I’m excited to read that one. I have never read it before. I chose a few new ones for the middle school reader in my house! We do a lot of traveling with the kids and we always read before we go! Love finding your website and all the book lists. I have a few book lists on specific destinations and lists save so much time!! Great resources you have here!